Bistro Saisons is a relatively new French restaurant in Oliver. I found it on OpenTable.com for Mother's Day brunch and the description stated that every mother would receive a free glass of mimosa and a rose. 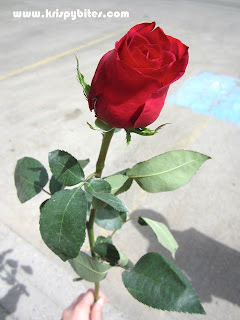 When we arrived, we found out there was no mimosa, but we did get a limp-looking rose. 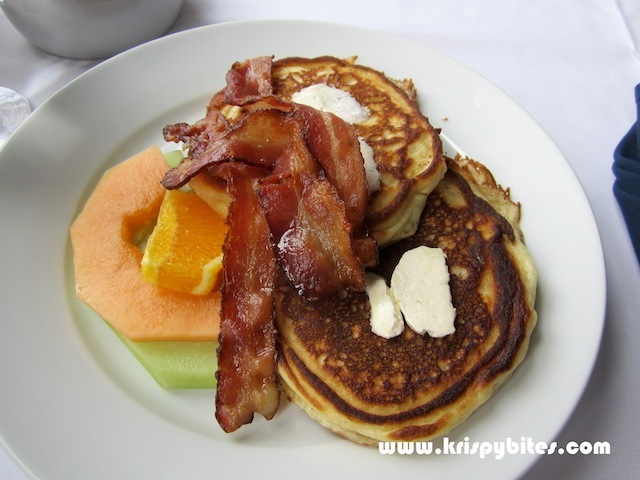 The brunch menu consisted of typical fare such as pancakes, French toast and egg benedicts. The food took a while to come, and afterwards as we were eating, our server came over and apologized because the kitchen had mistakenly prepared an extra order of 2 dishes which we now had to eat. I was rather amused because they could have just given the food to another table or eaten it themselves. I'm not sure why they had to keep apologizing and forcing us to take the extra dishes. 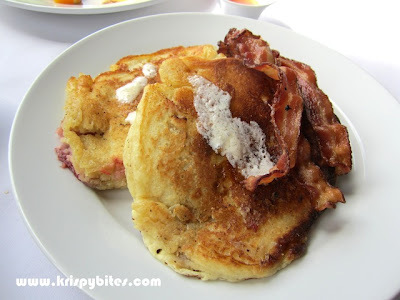 Normally free food is great, but these strawberry pancakes ($12) were not so appealing. They looked and tasted like failed kitchen experiments. When I first saw them, I was like, "Where are the strawberries?" Then I realized they were mixed into the pancake batter and cooked until they were mushy and flavourless. The picture below is the second plate of pancakes we got for free. It didn't look anything like the first plate, and the pancake was soggy and fell apart upon touch. 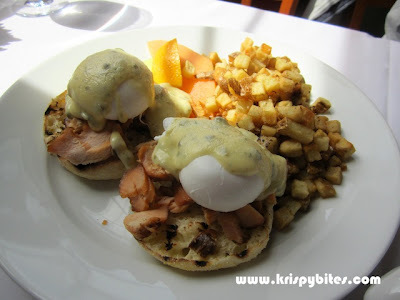 We also got an extra plate of smoked salmon benedict ($15) for free, but the salmon was completely cooked through and not cold smoked like I had expected. The meat was dry, tough, and lacked flavour. I liked the lightly seasoned hash browns though, as the tiny potato cubes were fried nicely to create a crispy golden shell. Unfortunately the hash browns were pretty much the only good part of the meal. 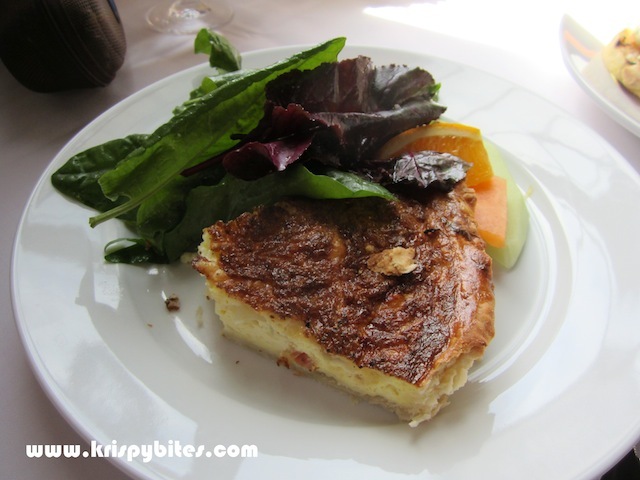 The quiche lorraine ($12) was a bit bland and the filling was almost entirely made of egg with very little other ingredients. The texture was like coarse steamed egg with lots of holes. I found out afterwards that brunch is really not this restaurant's forte. I don't think they even have regular brunch hours anymore. 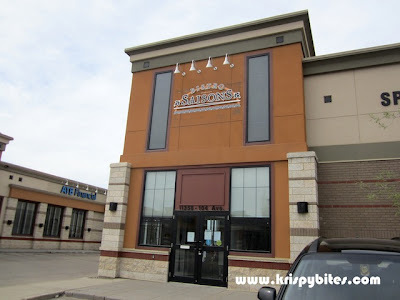 I've heard a lot of good comments about the dinner, so I'll give the place another try. And I just realized as I was writing this post that our server gave us another table's bill. I have "French toast" on my bill, but we did not order or eat any French toast. I'll reserve judgement until I try the dinner, but as it stands now, both the kitchen and front of house staff need a lot of work.